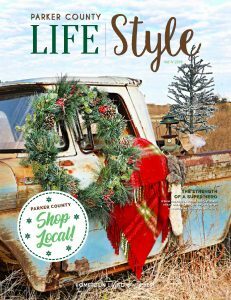 Parker County Lifestyle Magazine is published quarterly and distributed throughout Weatherford, Hudson Oaks, Willow Park and Aledo. We produce each edition with exceptional quality and content to become long-lasting, coffee table-quality magazines. The magazine is printed on high quality thick paper stock to give it a better feel and increased thickness. The spine of each publication is perfect-bound to resemble a book, and to hold together for many years to come. The covers are UV tinted to withstand exposure and maintain a quality our readers have come to expect. Editions of each publication are proudly displayed throughout businesses, professional waiting rooms and state legislative offices around the area. Being area-specific, the content within the pages of each publication is sure not to become dated or out of style. Residents have stated that each edition is a legacy, holding information about its people and events that one can reflect on and show for years to come. We would like to say Thank You for all those who’ve made Parker County LifeStyles possible. We look forward to bringing you many more editions for years to come. Please let us know if you have any article suggestions, or have an event you’d like featured in the pages. It’s been 55 years since Jim Coleman took a job at a little pharmacy in downtown Weatherford to be closer to his brother, who was serving an internship at John Peter Smith Hospital. 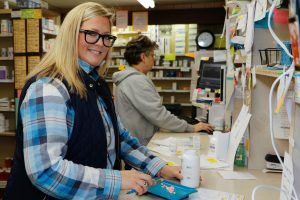 Jim is still there every day, greeting each customer—many who have been coming to Davis City Pharmacy themselves for decades. And he and the pharmacy are apparently what folks in Weatherford have wanted for many years. Even before Jim’s arrival, the little drug store at 111 Trinity Steet was serving customers in a fashion that put comfort and hospitality first, as far back as when it was Scarlett’s Pharmacy in 1924. Raymond George and his cousin, Clem Smith, grew up in the Prince Memorial Christian Methodist Episcopal Church, a little building with a big history, located at 410 W. Oak Street in Weatherford. “We used to have a lot children in this church, several came from Mineral Wells,” Raymond, 81, recalled. “There was this one little girl, she noticed I had a couple of dimes in my shoes (penny loafers). She just came right up and took them out. I kinda liked her, so I just let her take them.” Eighty-year-old Clem’s favorite memory rang a bell—literally. 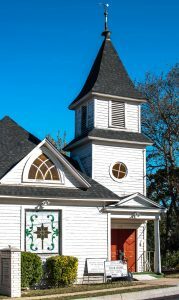 Now, they and others are fighting to create future memories as the church is undergoing a restoration. The roof was caving in, the walls were collapsing, and all the while, the small but devoted congregation has never abandoned their church home. They are meeting in a dinner hall in back of the church as work has begun, but they are determined to return to their beloved sanctuary as soon as they can. There is strength in numbers. 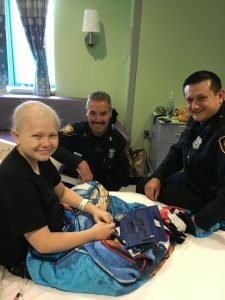 Strength, which is on full display in one eleven-year-old boy and his family from Aledo, is what the community is holding on to through faith for healing and a home for this family. Through Wilson Warriors, many in the community are joining together to pray for the Adams family who have had their fair share of loss and grief. 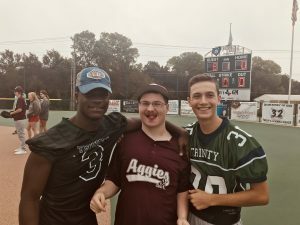 Their story of loss began when Daniel, the sole provider of the family and loving husband and father, had to quit work to battle a genetic liver disease. While Daniel headed to the hospital, Tamela headed to work to provide for the family. Unfortunately, with the hospital bills from Daniel’s two-year battle and his inability to work, the family finances, savings and retirement were exhausted and the family home was sold and the Adams family then moved into a rental. In September 2017, Daniel headed to Heaven to be with his Savior and Tamela was left to raise their three children. While they were focusing on grieving and healing, Wilson began to show signs of random vomiting and fatigue. After losing his speech and balance, Wilson was rushed to the hospital, for the first of many trips to come. A brain tumor the size of a lemon was found at the base of his skull at 3:00 a.m. on May 18, 2018–just months after his father had passed.